This is the stuff that you need to know before your visit (now might be a good time to get a coffee/cold beer and some snacks so we can have your full attention). You’ve just (or are about to) booked a day of the most amazing riding at Wairoa Gorge Bike Park (WGBP) - we can feel your excitement from here and we’re excited too! You are going to have a day of riding like you have never experienced before. But… before you get here there are some really important things to know to make sure your visit goes smoothly. Please take five minutes to read this document carefully. #2 - we highly recommend you put on some tough tyres. Something with a reinforced sidewall (Grid/DD/DH casing etc). There’s a good reason for this. If you bring lightweight tyres you will have a very high chance of puncturing multiple times due to the rocky/rough nature of some of the trails at WGBP. It is not uncommon for visitors with light tyres to puncture 5+ times, which makes their visit a lot less enjoyable than it should be. We like happy visitors, and happy visitors have reinforced tyres. # - know where we are and have directions printed out before you head off (we are in a steep valley and you’re phone won’t have a signal). You have to be with us by 8.00am at the latest - if you’re late we can’t wait for you due to the way the park operates - please don’t be late, it will make you sad and that will make us sad. It takes about 60 minutes to get to WGBP from central Nelson at a cruisy pace - please give yourself enough time to avoid any stress (no-one needs stress on a day as fun as you’re about to have). Directions are provided here and we have small ‘WGBP’ signs at the main intersections once you get off the main roads. Got that? Good. If you follow those points you’ll turn up on time and have the stuff you need to get your day started right. OK - now onto some things that will help you make the most of your day here. ● 8.00am - all visitors arrive at WGBP and park at Robbie’s Carpark (please don’t be late because the gate gets opened and then locked again at 8.00am sharp, and stays closed during the day. This is due to the terms of our lease and we have no flexibility). ● 8.30am - 12 noon - shuttling. Pick ups are at the Razor Bridge and at the Quarry. The shuttle vehicle leaves approximately every 60 minutes. ● 12 noon – 12.30pm - Lunch at Irvine’s Hut (we have an espresso machine if you want to bring some coffee, a microwave, fresh clean water and a BBQ that we can fire up). ● 12.30pm - 3.30pm - More shuttles, more riding. ● 4.00pm – All riders head back down the mountain to Robbie’s Carpark, tag out, high five all your new friends, and head home to plan your next visit. We have a great range of trails graded from intermediate (grade 3/4) through to expert (grade 6). Some of our advanced/expert trails are rough and very difficult to access in the event of an emergency so it’s a good idea to plan your first few runs before you come. We recommend you start easy and work your way up. ● You can also download the Trailforks app to your phone, which has all the WGBP trails loaded onto it: www.trailforks.com or search for “Trailforks” in Google Play or the App Store for iPhone. Make sure you do this at home because there is no cell reception at WGBP. ● Here is a link to lots of videos that will help you get a feel for what trails tickle your fancy. Arrival/signing in: you need to arrive at WGBP no later than 8.00am. When you arrive on site in the morning you need to register for the day and sign in. Just come and have a chat to the shuttle driver and tell him you have arrived and are ready for action. You will be given a tag with a number on it which needs to be zip-tied onto your handlebars. At the end of the day make sure you hand your tag back in, that way we can record that you are safe and have left the park. If you go home early for any reason you need to remember to let the shuttle driver know, and leave your tag with him. If you accidently take your tag home you need to contact WGBP immediately, because any missing tags will automatically trigger a call to the emergency services to perform a search and rescue, and in the case of a false alarm you might be responsible for the costs (plus we will be really worried, and you don’t want that on your conscience do you). During the day you will need to ride in groups of at least three people, and the group must stay together during each run to make sure everyone gets down safely. You can change groups throughout the day no problem as long as the smallest group on the hill is three people or more. Groups can be worked out on the shuttle up prior to each run down. If there is an accident or mechanical problem the group needs to be self-sufficient and ready to solve it. It is unlikely that our shuttle driver will be able to get to you - so we give each group two radios. We ask the group to deal with the problem/injury as best you can, and radio for help to the shuttle driver if it is really serious. The shuttle driver will then either arrange to meet you at a designated area or will call 111 emergency services and request a helicopter evacuation in the case of a serious injury. He will then remain in a good radio spot and help direct the helicopter to your location. There are no guides or bike patrollers at WGBP, and you need to do your own navigation. All the trails are very well sign posted and the grades clearly marked, you will also be provided with a map. Following the trails down will eventually lead you to the bottom of the valley at, or close to, the shuttle pick up area. Medical Conditions: If you have a medical condition or allergy you need to be able to manage that yourself, and carry whatever medication you need with you during the day. Be aware that you can encounter bees and wasps on the trails. There are also a lot of sandflies at Wairoa Gorge, we strongly recommend everyone bring insect repellent. A large portion of WGBP is set in beautiful native beech forest, where a huge amount of work has gone into weed and pest control, and native replanting. Please wash your bike before coming out to ride, to help prevent the transfer of any weeds. Make sure you carry out all litter and unwanted items from the trails (such as food wrappers and bike tubes) and put them in the bin. You will see signs and pest control traps around WGBP, please don’t touch the signs or any of the traps. The traps are checked regularly by professionals, and can be a hazard if you don’t have experience handling them. Hazards on the trails, like windfall and pig rooting, may appear on any of the trails at any time. If it’s something simple that you can correct straight away (like a small branch or rock on the track) then it would be great if you can stop and sort it out. 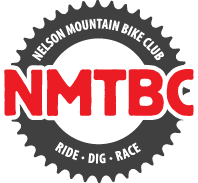 If you can’t fix it (like a fallen tree across the track) then let the shuttle driver or NMTBC volunteer know as soon as you can so the trail maintenance crew can fix it. We do our very best to keep all the trails in great condition - but WGBP is big, and we are dealing with nature, so keep an eye out and be ready to stop. Emergency meeting point: In the event of a serious emergency, such as forest fire, earthquake, flood or a serious injury to a rider everyone needs to assemble at the emergency meeting point (EMP) this is located at Robbie’s Carpark, near the front access gate where you parked your car. This point is downhill of everywhere on site so it’s easy to get there by bike. You need to stay at the EMP so we can account for people to make sure everyone is OK. In the unlikely event that a serious emergency takes place we will make calls on the radio so that everyone riding in the park knows that they need to go to the EMP. Weather: e operate in all non-extreme weather conditions, so if it’s wet just dress appropriately and maybe bring some spare riding clothes to get changed into at lunch time. The trails are very well drained with excellent grip, and do not get damaged by wet weather riding (winter is actually one of the best times to ride at WGBP - it’s a lot of fun and doesn’t get boggy). If we decide to cancel the shuttle day due to an extreme weather event that makes operating the park unsafe we will email you the day before and let you know. In that case you can move your booking to another day. Lots of riders do over 5,000m vertical descending in a day, but you are free to ride as much or as little as you like. You decide what suits you - no pressure. If you want to stop and soak up the views then that is fine with us. Pace yourself, get to know the terrain and before you know it you’ll be having the time of your life. See you soon!